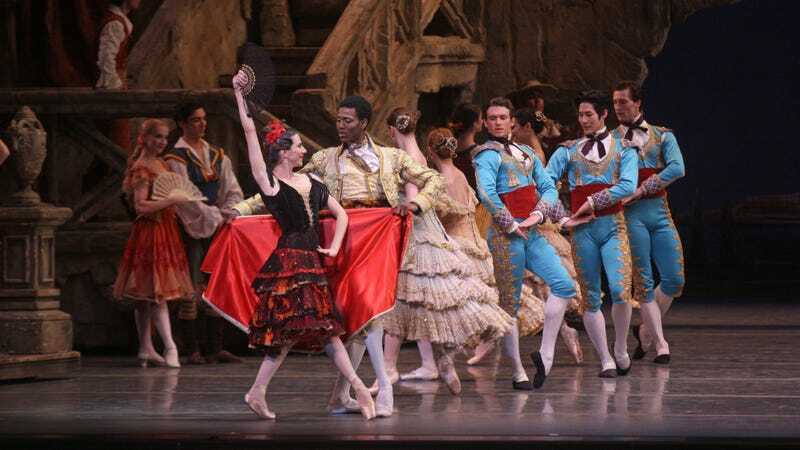 A recent American Ballet Theater performance of “Don Quixote.” Featured: Luciana Paris and Calvin Royal III. Photo via Getty Images. Saturday night, a ballet dancer used his profession’s athleticism to save a man who’d fallen onto the subway tracks. Davis hoisted the unconscious man to safety, handing him to others on the platform. Then he had to get himself back to safety, as he heard a train coming and couldn’t tell which track. He admitted, “I never realized how high it was,” but: “Luckily, I’m a ballet dancer, so I swung my leg up.” Well, luck or decades of incredibly hard work. Whichever you want to call it! “I don’t know if I had time to process it until I saw my wife coming down crying—then I realized it was scary,” he added. Of course, a close encounter with a subway track is a primal fear of many New Yorkers, right up there with getting hit by a falling air conditioner. Nice to think you might be rescued by a passing ballet angel.